So the trip to Vienna was obviously quite great. Amongst other things, I was able to visit Schonbrunn Palace, the zoo, a butterfly house, a Struass & Mozart concert, the Belvedere Palace, the Hundertwasser haus, a revolving restaurant, Roman ruins, the UN building, my brother and five art museums. The cuisine was delicious and hotel, the Marriot, was extremely comfortable. Public transit more than sufficed for travel within the city. 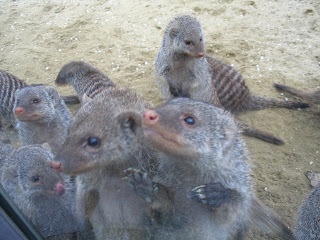 1) Meerkats using pack instincts and cuteness to acquire food, just like in the wild. 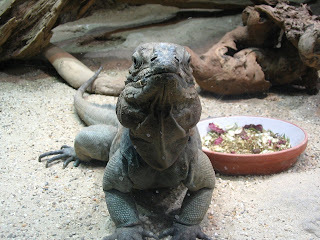 2) Lizard locked in a staring contest with me. Best Godzilla villain: Gigan, but not just because he has lasers, a cool color scheme and giant claws but because in his intermediate form he sprouts chainsaw pinchers. In the final stages he becomes the three-headed Kaiser Ghidorah and shoots fire rays from his mouths. 3) Revolving restaurant tower reflected in skyscraper (taken by my brother, Patrick). Best mirror scene: The final shootout in “Lady from Shanghai.” Runners-up include the passage into the underworld from “Orpheus” (1950) and the ironic 'mirror image' application of a scar from “Hollow Triumph” (1948). 4) The world’s most delicate thing: A spiderweb stretched between a flower petal and the tip of a wing on a sleeping butterfly. Sorry about the focus not being right. Zoom in near the red arrow to see web thread. Most delicate on-screen moment(s): The 10+ minute silent heist sequence from “Rififi” (1955) which has the audience holding their breath in total tension. Runner-up goes to the loaded moment before “confession” in the coda of “My Night at Maud’s” (1969). 5) Painter painting painter painting model. 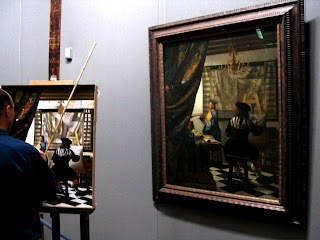 One of only 34 confirmed Vermeer's in the world. The rest, ironically, are probably forgeries.